Ray Rayburn edits this bi-weekly magazine. You can access past articles here. This book came out in 2000, and I was lent a copy to read in 2001. When I received it I was disappointed to find the drawings were sub-standard for a publication of this sort. They are low-resolution graphics that are often so small and confusing that they are pointless. Worse still, the text is a tangle of information and misinformation. Most pages contain errors and omissions. So I wrote down what they are - if you are unfortunate enough to have a copy, here they are below. On the plus side, a CD of various good sound/ bad sound examples is included. Still selling (if you search for it), at $35 it is not really worth it. Anyone wanting a good comprehensive book on this subject would be better served getting The Ultimate Church Sound Operator’s Handbook, by Bill Gibson (2007). This sells for $US29. It is comprehensive, being over 400 pages, with an included DVD. 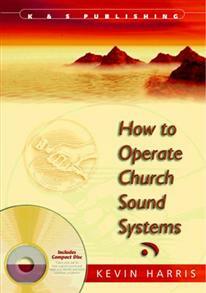 The first seven chapters are dedicated to how to serve as a church sound operator. Coverage of various topics has been carefully considered; for example, a whole chapter is rightfully dedicated to radio microphones. In contrast, Kevin’s book, which is subtitled ‘A Complete Training Manual…’ gives only one page to the important aspect of serving as a church sound person, and radio mics get barely a mention. The Ultimate Church Sound Operator’s Handbook is critiqued here by Ray Rayburn, where he tackles some misinformation in the Interconnections chapter. p3-6 There is a strange Table of Contents with lots of detail (and everything underlined!). Detailed, but not very clear. A briefer TOC and an alphabetical index would have been better. p9 fig. 1. The XLR female connector shown is a Plug (not a socket). p9 fig. 1. “RCA” connectors have the full name RCA Phono, and “Phono” connectors have the full name ¼ “ Phono. So, to avoid confusion in practice, they are usually called RCA’s and Jacks, not RCA’s and Phonos. p9 “These connectors (commonly known as jacks)…” All cable connectors are not called jacks. This term is reserved for the ¼ “ phono type, and is short for Jackplug (the jack, in fact, being the socket on the equipment). p9 suggesting the Mono type is for use with microphones is just silly. Although this is true for a 1950s home tape recorder, it is completely unsuitable for a sound system. p9 “Stereo” If a ‘stereo’ jack is used for a balanced line it is not an XLR. p10 “Another option is to make them yourself…” No mention here of Appendix B, which has information on this. p10 “…always choose XLR jacks.” Two problems here – XLR’s are not Jacks (pity that didn’t get sorted on p9!). More importantly, this statement could easily lead to bad practice. Following advice from the previous paragraph, I could easily build or buy an adaptor to put a line level signal into a mic input on a mixer and overload it. Or, again using an adaptor, plug a mic into the line input of a mixer (which has no mic preamp, and is possible unbalanced). In short; microphone and line levels are not distinguished. p11 “Output can also be called Line Out”. Not always true, eg fig 3. shows an Out from the guitar amp going to an In on the mixer. Guitar amps often have line outs and extension speaker outs (which can fry the mixer input). p11 The last paragraph suggests reading the labels on the mixer (good idea). Before we connect things and power up a mention of reading the manual would have been a good idea too (all the more important now, as this book teaches us enough to be dangerous!). p12 “…stereo master…”, “stereo…power amplifier…” In view of how simplistic the description is here, there seems no point in stressing stereo. Many small systems are (either by design or operation) actually mono. Also, mixers often have a single master fader to control both L and R output levels simultaneously (this eventually gets a mention on p33). p13 The last paragraph is misleading. It should say, “special cable is needed between power amplifiers and speakers. Do not use audio cables (eg mic, guitar), as there will be a lot of power loss. p14 “You can run it alongside the multicore snake cable without any problem” This is not always true. Best practice is to separate the power cable by at least 10cm so the 50Hz mains doesn’t get induced into the signal wires of the snake. p15 fig.12. both the keyboard and the guitar are connected to the effect pedal, which is a bit misleading (pun intended). p16 Graphic Equalisers are introduced here, and again on page 38, but there is no mention of their purpose until ‘controlling feedback’ is covered on page 60. This is a bit disjointed for this essential topic. p18 “…you can easily drill a hole and insert one.” Whoa, we need to read the warning on page 29 before gleefully connecting speakers in parallel. p20 There is no mention of the desirability of having the mixer distant. Nor is there any mention of how important it is to have the power amps as close to the speakers as possible. p21 fig. 24 and the associated explanation is completely irrelevant for a book of this nature (ie for beginners). p21 “…the kind used on big cardboard boxes” This is parcel tape, which is not Gaffer Tape. Also, mention of taping techniques would be good. In any case this note should be in Chapter 3 (under order of setup). p22 no mention of stereo channels. p22 Omits to mention that often it is the sermon only that gets record, in which case an auxiliary send is a better way to route the speakers mic to the recorder. p23 “you should have no problem splitting normal audio outputs two ways” Maybe, but this book is written for amateurs. Best not to lead people into murky DIY waters. p23 “When everything is connected together…” Ironically, the picture (fig. 29) doesn’t show any connections! p24 “(see previous page)” This statement does not refer to anything. p25 “Any two parallel reflective surfaces will cause ringing (reverberation).” Wrong acoustic information here: reverb is not dependent on parallel surfaces – that explanation belongs to flutter echos. Secondly, there is confusion of terminology. Reverb is not called ringing, especially as ringing is a term used to describe the onset of feedback in a sound system. p27 “An alternative to calculating…” no details on how to do this are provided. The formula is ∂t = D / V, where ∂t is the time delay (in Seconds), D is the distance (in meters), and V is the velocity of sound (taken as 343 m/s). p28 “In sound engineering term, ‘quadruple’ means a change of 6dB” Yes, if we are considering power, no, if (as is often the case) we are talking about pressure. For example -6dB is half the voltage. p28 “…and a clean sound” Clean sound is achieve by having reserve power to handle peaks. It is nonsense to state that we can get away with less power because we have a clean sound source. p28 pagination problem: p29’s heading is at the bottom of p28. p28 “It is quite alright to be using more power…” In most church situations this will cause major problems: the monitor speakers to be heard from FOH, making the sound indistinct, ‘volume wars’ occur making the foldback mix difficult to setup, and, feedback from the monitor system is more likely. The best practice is to try to keep sound levels as low as possible in the performance area. p28 The paragraph discussing ‘how many watts?’ makes no distinction between speech and music use. 100W may be more than enough for a speaker to address 300 people, but 1000W is more appropriate if band-style worship is required. p29 “…power, are measured in watts(w) and ohms(Ω).” This sentence bundles these two terms together. p30 …”or 60Hz” In New Zealand this frequency is not used. If the information is intended for international use then that should be clarified. p30 no mention of earth loops between equipment (rather than between 230v phases). p30 “Light dimmer-switches…can also be sources of hum.” These cause buzz, not hum. So, this part should be a separate paragraph. p30 Again, due to the DIY content of the text, there are some safety issues here. A warning not to remove any safety earth is needed. p30 “…ask an electrician to fix it…” Fixing hum is beyond the range of most electricians. A technician is required for this work. p30 (last one!) There should be a mention of balanced and unbalanced lines here, since we are looking at how to avoid hum and noise. p31 The checklist is a bit early on in the book (there are items on the list yet to be discussed). p32 “…rather than an in-line recording studio mixer.” It seems pointless to mention this. p32 “There is no difference between a knob and a fader.” Well, sort of (hey, we are all potentiometers, here!). To be precise, a fader can be either a slider type or a rotary type. The main point missing here, though, is that it is too hard to quickly and precisely control a mix with rotary faders. This is why the more expensive and larger sliding faders are so common. p33 The second paragraph bundles panning and mixing together rather than distinguishing them ie pan to position the sound, channel faders to adjust the relative levels (which is called getting a good mix). In any case it should be made clear that the faders deserve a much greater priority than the pan controls. p34 fig. 47. The left drawing is showing the channel inputs of an in-line recording mixer. p35 “…volume knob. It is called gain…” This error is reiterated on p38. Gain is not the same as volume, and the difference is important. Volume is how loud we perceive (hear) sound. On a mixer this corresponds to channel fader position (individual sound) and master fader position (mixed sound). The gain or trim control has a quite different purpose – it sets the channel signal level to be optimum (between noise and distortion) for the mixer. p35 “…the signal will become distorted…” This is not true. What happens is that at some point above the normal (0dB) level there will be distortion. How soon this happens is the important part. Better equipment can handle a wider range. The difference between the normal (nominal, actually) level and the distortion point is called headroom. p35 “The correct way to start…” Actually there is nothing really correct about this ‘cowboy’ method of setting input levels. The proper way is always to set the input level peaking at 0dB on the solo. Only on budget gear with no PFL / Solo metering should the stated method be used. p36 Yet more level setting confusion in the second paragraph. To say the sliders are for minor level adjustments, and the gain is for major level adjustments suggests that they are coarse and fine controls for the same thing (which they are not). p38 “…filter, or equaliser (they are the same thing).” No they are not; and here is the basic difference – a filter can only cut some frequencies, whereas an equaliser can apply cut or boost to some frequencies. p38 “It looks like a shelf.” This sentence is meaningless, without showing a graph of the filter characteristic curve. p39 “…turn the cut/boost knob half way around…” Taking this instruction literally would put the control at the centre position (ie no cut or boost). Sweeping the frequency control will then give disappointing results. p38-45 This detailed section on EQ misses an important point. A major (and often over-riding) factor in EQ settings for sound systems is to avoid feedback. p40 “…(wet and dry).” Not really terms used with EQ. A good word to add here would be ‘bypass’. p41 “…it is obvious that we have an excess of bass.” Not necessarily; the problem may be a lack of treble. p43 Human voice. “There is very little freq until 8kHz.” “There is very little freq until 6kHz.” In both case the word until should be beyond. p43 “Compressors…” This mention of compressors and reverb is not really relevant to this section. p43 Choirs. “Omni-directional microphones are not always a good idea.” It should say never a good idea (for live-sound). There is no place for understatement in a book like this. p47 “Turn the send #1 master knob back accordingly (instead of all the channel sends).” This method can actually create distortion (by overloading the send buss). For best gain structure the master should be close to unity, and the channels sends adjusted according to getting the signal peaking at 0dB on the aux. solo meter. p51 Direct Outs. This section is irrelevant (considering the intended reader). p52 Sub-Group buss outs. This topic is also beyond the general scope of this book. p52-53 Solo & PFL. “Recording studio mixers have solo buttons…” Some livesound mixers do use the term Solo. The important thing here is not the name, but the function; Solo (or PFL) must only act to the meters and audition to headphones, leaving the mix going out to FOH. p54 “The actual signal level peaks are always higher than what you see.” Well, no – not in the case of a peak (LED) meter. That’s why it is called a peak meter – it reads the peaks! Don’t be fooled by the meter reading being a bit sluggish on the way down (a delay is built in to allow our eyes time to register the level better). p54 A word about how the signals on the mixer channels aggregate would be good here. Let’s say a full music group is running and the mix out level is peaking at 0dB. Next up is the sermon – one person talking may not even show on a meter that only reads down to -20dB. This is quite acceptable but not obvious to an inexperienced sound operator, who may lift the level only to have ‘feedback central’ at the next song. p55 part H. This gain setting procedure is flawed. Gain setting is for the sake of the mixer (as mentioned above), and is done independently of controlling feedback. p55 no mention of labelling (eg the mixer channels), gaffering. or speaker positioning. p56 there is no mention of setting the input levels using PFL. Most likely the equipment used will be ‘semi-professional’ which has this feature. Rather, this book should stress correct practice ie the importance of firmly insisting on getting time for sound checking. p58 part E. Other things need mentioned here: pull all the faders down, zeroing the mixer (or putting it back to the default settings). p59 paragraph 3. “…balance the microphone levels using the gain knobs.” This, again is incorrect procedure. The balance is achieved by using the faders (that’s what they are for!). If that is not working check the singers’ distances to each mic. p60 part A: a bit oversimplified. Feedback is caused by excessive open-loop gain, so of course it can be affected by the gain control. A gain set a 3 o’clock can be stable and is sometimes necessary to get a good level. p60 part H: this is erroneous. It is the total gain of the system that decides the feedback threshold. p60 Feedback part A: no mention of howling, or ringing. p60 Feedback part A: “…and send them through the floor monitors as well.” This bit really needs a note stating that feedback can be controlled but not eliminated. If all aspects of feedback reduction are not used there will simply be no feedback because the system is providing inadequate volume. p62 “More modern ones…” Electric mics are inferior to condenser types. They have not superceeded them. p62 “These are called condenser or electric microphones.” No distinction here between these two types. p62 “…are the most common in use today.” Misleading; moving-coil type dynamic mics have been the common type for livesound for decades. No point alluding to a time when carbon and crystal mics were used. p62 “Condenser mikes are not suitable for loud-volume instruments…” An un-useful generalisation. For example one might be used on a grand piano. Mention should be made of the fact that many condenser mics have a pad (attenuator switch). p62 “…wired according to the international convention.” No mention of what this is (ie IEC 268 part 12). The correct wiring should be clearly shown. “...provided there are no cable faults.” also needs added here. p63 fig. 76. The internal mic-preamp is omitted from the diagram. This would have been a good place to explain the difference between electret and condenser types. p64 The term ‘polarity’ is wrongly used here (this is particularly unhelpful as polarity does relate to microphones in a completely different sense). The correct term is polar pattern (polar response, pick-up pattern, or directivity). p65 apart from the above mistake, this very important section is poorly dealt with. More detail on the different types of directional polar responses is needed. p65 Omni: “Use them carefully” This is nonsense – don’t use them at all for liversound. Mention of the clip-on type being omni is pointless as it is reinforcing that omnis are ok. These special lapel mics come with the transmitter so the sound operator does not have to choose them. p67 “…it may have proximity effect.” Proximity effect it is not determined by whether a mic is dynamic or not. Any directional microphone will exhibit this effect. Consequently the advice to give a singer “a mike without a very strong proximity effect.” is wrong – don’t give them an omni! p67 “…there is have…” typo. p68 “It depends on the air temperature and the humidity.” What? We are trying to place mics in a church, not select talkback mics for the space shuttle! p68 “Shiny…” eh?, are we talking about sound or light here! p68 A3. This is only true for the cardioid polar pattern (this point should have been covered on p65). p68 A4. “…little basses…” typo. p68 A6. The very helpful 3:1 rule needs mentioned here. p69 A8. Feedback needs mentioned here. In live-sound we are not free to place mics at any distance we like to get a desirable sound. To get enough volume without feedback over-rides this. p69 A9. This bad advice negates the pints made in point A6. p70 D1. This advice is faulty. A cardioid polar pattern reaches out to the sides (-6dB at 90º), so the best technique is to have the singers gather around the mic in an arc. p70 E2. “Guitars have two chambers…” Just one, actually. P70 E4. “…(try taping a cover over the sound hole…” no, don’t (the guitarist probably won’t let you anyway) – move the mic further back, off the sound-hole, or use bass-cut on the mixer channel. p71 F1. “…can damage condenser mikes…” possibly, but this warning sounds more suitable for ribbon mics. Consider a condenser mic on high-hat (quite high SPL at 2” distance). p71 F4. “…the best way to start…” No understanding of instrument amplifier gain structure. It is not simply a matter of gain up and volume down (or vice versa) to minimise hum. The gain sets the amount of distortion and volume sets volume. These will be set to give the desired tone. While we are at it, why are we not DI’ing the keyboard amplifier (the preferred method)? p72 G7. Since ‘under and over’ miking of a snare drum is mentioned (which is a mistake in itself – hey this is meant to be a book for church sound operators!) it is important to point out that one need to be phase-swapped (then again, that is silly too – many live sound mixers don’t have phase-reverse switches). Oh, what a tangled web you have weaved, Kevin. p73 H1. The saxophone is a woodwind (reed) instrument, not a brass instrument. p73 I2. “Fresh mikes are best for this…” This ‘fresh’ word is going stale. How is a person reading this book going to know what that means? It would be more informative to talk about mics using (properly described) standard terminology – type (eg condenser, PZM), frequency response (ie wide and flat), and polar response. p74 Horizontal piano, point 5. Irrelevant information for this book. Not mentioned, but much more practical, is using a PZM taped to the underside of the lid. p76 considering the basic level this book is set at there is no reason to take readers into the murky depths of stereo miking techniques. Stereo for live-sound at this level should be avoided. p76 finally the 3:1 rule gets mentioned, but infers that it has some special relationship with stereo miking (“…for this type of miking.”). p77 “…narrow the original stereo image…” only if 90º X-Y is used. Wider angles (eg 120º, 135º) will widen the image. p78 Microphone stands. This section is incomplete – there is no mention of goosenecks (as is commonly used on a lectern), no mention of boom stands, and nothing on how they should be set up and adjusted (and who by – eg sound person or singer). p78 Here would be a good place to deal with cable rolling, which is not covered anywhere in the book. p79 fig.103. A good example of how poor the graphic quality is. There is no way to identify what a miniature condenser mic looks like from this picture. p80 “…but are more expensive to buy.” The opposite is now true. p81 fig. 104. The idea presented of using a ‘stomp box’ effect on a mic is a bit amateurish. p85 “…moving within the normal range.” Which is? It should say ‘peaking up to 0dB’. p87 Thru. This is not a standard term for this feature. In fact these ‘filter defeat’ buttons are so rare as to no warrant a mention in this book. p88 It needs to be made abundantly clear here that reverb is not added to speech. p93 “(This is done electronically, so it doesn’t cause squealing)”. This is likely to be confusing, as earlier in the book it was stated that feedback can be generated electronically (which is true). The actual reason is because the feedback signal is not in phase with the original, so no reinforcement of that particular frequency occurs (hence continued feedback will sound like white noise). p93 missing close-bracket (last paragraph). p103 Note: “…always use…” The exception is speaker cables, which are not screened. p103 “(it is even becoming popular today…)” popular isn’t a word used for technical matters. Without going into this (rather complex) matter further, let’s just say we should be talking science here, not fashion. p104 The meter needle is showing back to front (ie on an analogue multimeter, zero ohms will put the needle to the right (FSD; full scale deflection). p104 part 3. There is no mention of typical ohmmeter readings when testing loudspeakers. p104 Impedance is confused with reactance. Non standard terminology gets used throughout the book (for example: p21; the monitor mix is called “floor monitor levelling”. No mention of speaker selection. No overview of different types of church systems (eg speech only, contemporary or traditional styles of worship). No mention of hearing-aid loop, 100V systems, permanent installations, and radio microphones (well, almost nothing on that one). No separation of beginner and advanced knowledge. No mention of whether musicians should use back-line gear, mics on back-line, or DI’d into the P.A. Too much emphasis on DIY solutions, rather than choosing and using gear in a professional way. There is too much detail on FX (eg reverb) at the expense of good descriptions of the essential aspects. On the CD, track 6 is titled “A clean sound, which becomes distorted” but only a grossly distorted signal is presented. Also missing from the CD are any examples of howling or ringing types of feedback. At risk of being labelled pedantic, I have written these corrections because it is important that people get clear and correct information on this topic. The loose sort of information this book offers can be found on the Internet, but has no place in a written publication. A little knowledge is a dangerous thing – the author’s knowledge of live-sound is clearly limited, and much of the information is more relevant to studio operation. A pity really, because there is much good material in the book, but there are so many errors and omissions that I cannot recommend it. So there you have it. The book was proof-read by Alice P Meager (ah, such irony: a meagre proof-reading effort, to be sure).